"Mooooove over Daisy, coming through." "I will most certainly NOT mooove over, who do you think you are?!" "Jeez she's such a primadonna, just coz she's got white on her face"
It looks like those cows are exchanging a word or two. That is so cool! 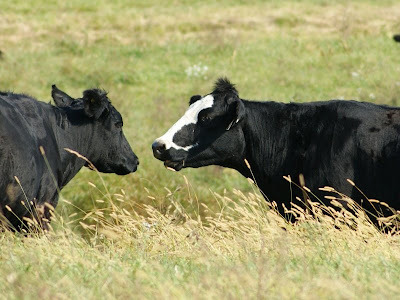 It looks like the cows in those commercials that talk to each other! Your right Tammy it does hahaha I like how the one has a white face pretty. I wanted to let you know it's cool if you put the tag on both blogs.I can't wait to see your answers.